The chia plant, or Salvia hispanica, is a flowering plant related to mint that is native to Guatemala and southern Mexico. From historical records, it is known that the Aztecs cultivated chia before the Spanish explorers arrived and many historians believe that it may have been part of their food staples alongside maize. The people of this region still eat chia seeds today and either grind them up or eat them whole. So what makes chia seeds more than a cool toy from the 1980s? Chia is a legitimate superfood because of its nutrient content. The seeds are full of healthful omega-3 and omega-6 fatty acids, they have high levels of protein and fiber, and no cholesterol. They also contain minerals in significant amounts, including calcium, phosphorous, potassium, zinc, copper, and manganese. 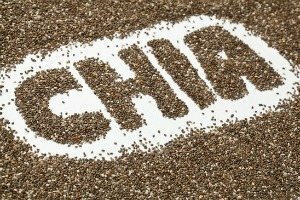 Research into the health benefits of chia is gaining ground, but it only adds to what people have already known for centuries: this is a potent superfood. The healthful nutrients in chia seeds are good for your overall health, but there are also some specific benefits that you can expect to see if you add them into your smoothie diet. Weight Loss: Chia seeds can be a beneficial aspect of any weight loss program because of their ability to keep you feeling full. Because chia seeds can help to keep your blood sugar from spiking and dropping and because they are high in fiber, you will experience reduced hunger pangs when you add them to your smoothies. Energy: The nutrient combination and ratios in chia seeds are such that they provide you with long-lasting energy. Legend has it that the Aztecs used just one tablespoon to sustain a person for 24 hours. Pain Relief: The Aztecs were known to use chia seeds to relieve joint pain and irritated skin. Heart Attack and Stroke: Chia seeds act as a mild blood thinner when consumed regularly. This means that it can help to prevent the clots that lead to heart attacks and strokes. Blood Sugar: You will find that eating chia has a positive effect on your blood sugar levels. Chia seeds are low on the glycemic index. When you eat it with other foods, it can help to decrease the damaging spike in blood sugar levels that you often get up to an hour after eating. This will have the added benefit of reducing your later sugar drop. Blood Pressure: High blood pressure is detrimental to your well-being and can lead to severe cardiac health problems, including heart attack. Research has indicated that diabetic patients consuming 40 grams of chia seeds per day experienced significantly reduced blood pressure. Inflammation: In the same study, the diabetic patients were also found to have a reduced measure of C-reactive protein, or CRP. CRP measures the amount of chronic inflammation in the body. Lowered inflammation can reduce the risks of heart attack and stroke. Digestion: Chia seeds are a great aid to proper digestion because they are so high in fiber. They have nearly 28 percent more fiber than flax seeds and have both soluble and insoluble fiber. This slows your digestive process down, allowing it to function properly and keeping you regular. Cholesterol: Several nutritional components of chia seeds contribute to lowering your bad cholesterol levels and raising the amount of good cholesterol in your blood. These include fiber, long chain tricglycerides, and linoleic acid. Which is better, chia or flax seeds? While both chia and flax seeds are rich in omega fatty acids, chia seeds are protected by their antioxidants. This helps the seeds to last much longer without becoming rancid. Additionally, you do not need to grind up chia seeds in order to get to the nutrients, as you do with flax seeds. What do chia seeds taste like? One of the great things about chia seeds, especially when added to smoothies, is that they have very little flavor. They taste very mildly nutty. If you add them to your foods, you will be adding in nutrition without changing the taste. Besides smoothies, chia seeds are great sprinkled on salads, yogurt and oatmeal, in soups and omelets, to thicken stews, and many other creative ways. How are chia seeds sold? Most often you will find the seeds sold whole. Because you do not need to grind them up, it is simple to buy a bag of seeds and add them to your food as needed. You can, however, also buy chia seeds as a powder. In this form, you can use chia in baked goods or whenever you want a smoother texture. What is a typical daily serving? There is no officially recommended amount of chia to eat each day, but a typical serving for an adult is one ounce, or 28 grams. Using more than that should not be harmful, however. One ounce has 137 calories, four grams of protein, 11 grams of fiber, nine grams of healthy fats, as well as several minerals like calcium, phosphorous, and manganese. Is there a difference between black and white chia seeds? The same plant produces two different colors of seeds, which depends on the color of the flower. The black seeds are really a mixture of brown and mottled seeds, while the white seeds are white, gray, and yellow. There are some small differences between the two in terms of nutritional content. The white seeds have slightly more protein and a little less fiber. For the most part, it does not matter which kind you use, but just to be sure you are getting all possible nutrients, you may want to use a mix of both seeds. What is chia gel? Add water to a small amount of chia seeds in a container and watch what happens. In about 20 minutes you will see the chia gel. This is a result of the high fiber content of the seeds. The same substance forms in your digestive tract when you eat the seeds and this is likely the reason that chia is digested slowly. The slow rate of digestion means that the carbohydrates are more slowly broken down into sugars and is why you will not get a blood sugar spike after eating chia. Chia seed gel is perfect at rendering that signature smoothie creaminess we all love. To make your own chia seed gel, combine 1 part chia seed to 1 part water in a small container and let sit for 15-20 minutes. Refrigerate afterwards for use in smoothies for the next several weeks. 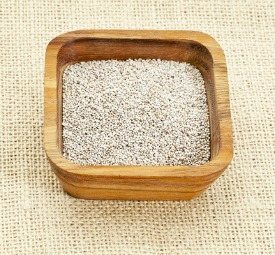 How should I store chia seeds? You can store your seeds in a cool dry place, without using a special container or refrigeration. Just keep them in a paper bag that is rolled shut and put it in the cupboard. Your seeds will be good for up to two years. Because chia seeds have minimal flavor, you can add them into any smoothie you make to boost the nutritional content. Use about one tablespoon for eight ounces of liquid in your smoothie. Anymore and you can end up with a smoothie that is more gel than drink. There are three ways in which you can add chia to your smoothie: as whole seeds, gel, or as a powder. My favorite chia seed smoothie recipe of all time is this Chocolate Chia Seed Smoothie. For all of my smoothies featuring chia seeds, click here. I’d love to know if you use chia seeds in your smoothies and cooking and what health benefits you have experienced – please tell in the comments below. Chia seeds were at one time hard to find in the American food marketplace, but now that so many people recognize the important health benefits they can provide the seeds have made a comeback. You may even find some at your regular grocery store these days, but if not, you can find them in any health food, or organic food store, or online. Hop on over to Mountain Rose Herbs for the best price and quality around. They usually come as whole seeds, but may also be purchased milled, in a flour form. Since both chia and flax are used in recipes with similar benefits, if only one were purchased, is there a preference? I see chia is a bit more costly, not much though. Hey Ron, I prefer chia seeds and feel they’re more nutritious and beneficial to your health than flax seeds. If you put the seeds in a blender when making a smoothie does the grinding effect the value of the seeds at all either nutritionally or as roughage? Or should I make the smoothie and put pre soaked chia in afterwards for best effect please? As far as I know the nutritional value is not diminished by blending, nor is the roughage effect. Using chia seed powder on the other hand probably reduces the roughage effect. I prefer the pre soaked chia seeds because they lend a little body to a smoothie while drinking. If not pre soaked they would eventually gel in your stomach and intestines. Ron: I noticed that chia seeds provide long-lasting energy. Does this mean they will keep me awake–that I shouldn’t use them in the evening, like with a dinner smoothie? Good question, Jul. I haven’t found that to be the case – keeping you up if eaten later in the day or at night. They’re not stimulating like that. It’s their robust nutrient profile that leads to a long-lasting, sustained energy. Hi Ryan my name is Dylan and i was just wondering if you could give me a delicious recipe for the ingredients i have. Hi Ryan. My husband and I are coming down with the flu. And my husband also has acid reflux. Do you. Have a smoothie recipe to coat the stumach and relive pain some. Chia seeds are cheaper @ local chain grocery store than @ link provided. Make sure to look around. A good ratio is 1 tablespoon for each cup, Louise. Yes, chia seeds and tinned (canned) fruit in a smoothie are a good combo. I just started using chia (and flax) to replace the pudding I was using in my protein shakes. Seems the chia really thickens up the shake/smoothie to a perfect consistency. Love it, thanks for all the info! You’re welcome, James. Yes, chia seeds are a good thickener. Can my pre-schooler eat a smoothie I make with Coconut Milk, Chia Seeds, Cacao Powder and Maca? (I also include banana, berries and spinach). All of those ingredients look good except maca, Karen. I would wait a couple of years before including that. is it a waste using organic chia seeds,organic hemp seeds and organic spirulina tablets together ? Not a waste at all, Trevor. Each brings its own unique nutrition to your smoothies. I typically add one heaping tablespoon, Shanae. Great text, very helpful for someone who doesn’t know anything about this food. I would like to add that you should be careful because 100 g of chia seeds have almost 500 calories – don’t exaggerate with them or with any other food when you have chia seeds meals. Good point, Stacey. They are high in calories if you consume them in quantity as a meal. hi,i buy the chia seed powder from the bulk barn and I have had really good results from putting this powder in my smoothies along with protein powder,frozen fruit,half a frozen banana,natrel milk,or almond,coconut,cashew,rice dream milk,coconut flakes or shreds,stevia powder etc in your smoothie recipes,not all at once through and I mix up these and I have tried new ingredients,mixed them up and I have even made up some new smoothies that taste realy good. there are still many recipes that I haven’t tried from your website that includes your elixers. the diabetic smoothies,macadamia coconut smoothie,the elixir smoothies,and the pumpkin smoothies.i will let you know what I think of these smoothies after I make them in my magic bullet blender. have a nice day tomorrow and I hope to hear from you soon. what does the Halloween smoothie taste like? You are rocking the healthy ingredients and smoothies! Hii Ryan, is it necessary to blend chia seeds after soaking in water in order to loose weight? Are the blended chia seeds are more helpful for weight loss? Hi Omi, I don’t think it matters much either way. Blended or not blended and soaked, both are good for weight loss. I was under the impression that you should not eat them raw..that they can dehydrate you as they absorb water. Is it best to use gel in things like smoothies that won’t have them soak long enough to start gelling? I prefer to use the gel in smoothies because it adds a little extra thickness. Raw they will absorb moisture, but not enough to cause dehydration unless you consume a significant amount without liquid. A tablespoon raw in a smoothie is not an issue. That sounds right, Kristina. Long lasting weight loss can take time.